Takoyaki like you've never had it before. 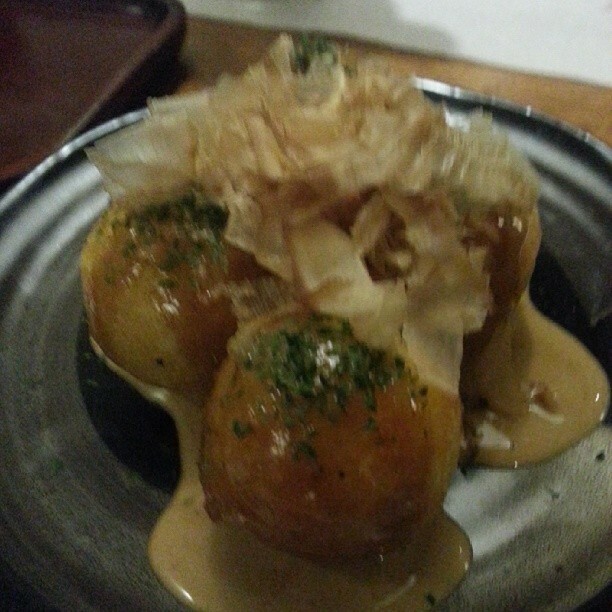 It was my first time tasting a Taco Potato at Izakaya Kenta in Malate last Saturday with fellow foodie bloggers. I've seen many Izakaya Japanese resto around Manila and it was delightful to experience Izakaya Kenta which was announced to be acquired by a Filipino brother and sister who grew up in Japan. The ambiance will take you to Japan and the food will take you to bliss. We were first served appetizers like the Potato Salad and their famous Supageti Sarada. The lettuce that was prepared so beautifully, it seemed so hard to partake until the pack of hungry foodies grabbed their forks and took some on their plate. The vegetable were crispy fresh and their potato was so delicious almost all members of the table took a second helping until it's gone. The Mixed Sushi Platter was served next carefully prepared along with their Sashimi (raw fish and raw squid). I was too happy with the thin-sliced ginger that I have forgotten to offer some to my friends on the table. 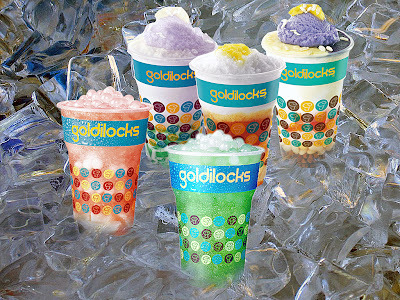 It was fresh and sweet and it never failed to put a smile on the faces of my friends after every bite. Even those who do not eat sushi and sashimi had to get some to be convinced and they have completely had a change of heart never to eat raw fish and squid after tasting Izakaya's Mixed Sushi and Sashimi Platters. After the serving of the main dishes Tori Karaage (fried chicken), Itememono Gyu Suteki (Beef) and Gindara Teriyaki (Fish), we had to ask for more rice with their unforgettable miso soup (which was usually served with seashells not available that time we were there). Soon after we had a visit to the kitchen to witness how the Japanese chefs of Izakaya Kenta create their beautiful and delicious sushi and sashimi. The chef explained how each sushi was cut perfectly for bite size pieces using the most fresh ingredients available from their suppliers. I came back to the table enjoying Sake (Japanese rice wine) to check if I have outgrown the fear of drinking hard liquor all these years. 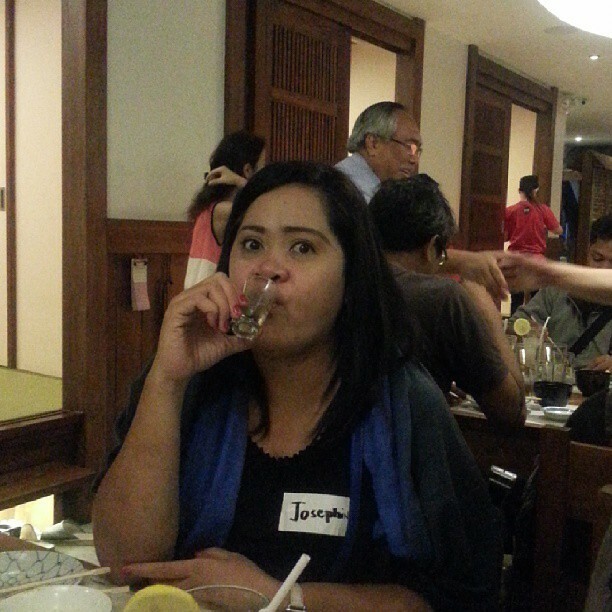 A sip of Sake and a nibble of sushi is enough to keep the conversation growing on the table. The growing conversation turned to infinite laughter as the pack continued to gag about what could customers do inside the rooms with low tables and pillows. 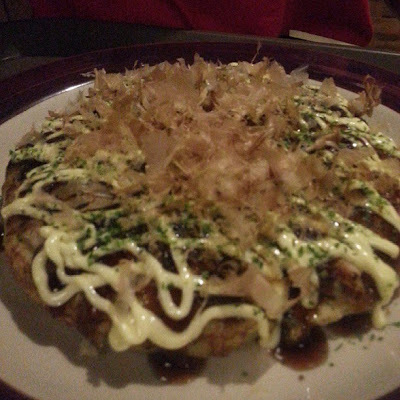 The piece de resistance was Okonomiyaki , Japanese pizza that seemed like a thick pancake with meat and goodies fillings. I could not remember if the meat was seafood or chicken but the thin fish flakes on top was to die for. It was punctuated by the mayo and special sauce drizzled mixed on top that's too hard to forget. No wonder the others had created a special restaurant just for Japanese pizza. It was delightfully tasty to leave you wanting for more. Izakaya Kenta food price ranges from Php250-Php550 (each main dish depending on the ingredients and the size of servings), affordable and really worth the budget. I will definitely be back for more of their Taco Potato and Okonomiyaki Japanese Pizza or simply sample their Teppanyakis next time I visit Malate. 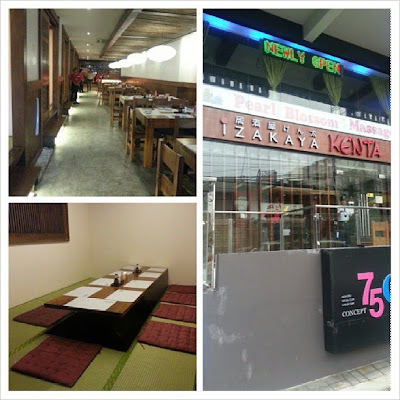 Get your friends visit Japan without having to pay for pricey plane fares by indulging on a culinary adventure at Izakaya Kenta located at G/F Malate Bayview Mansion, 1781 M. Adriatico St. Malate Manila. 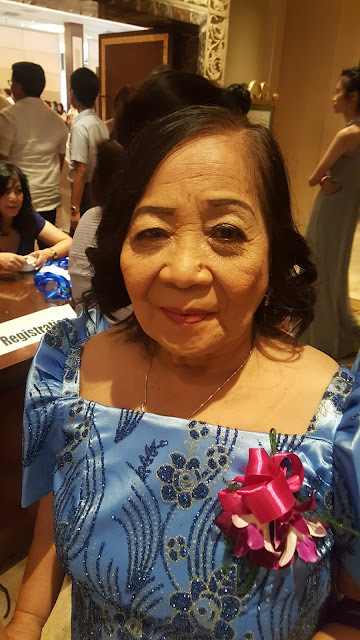 For reservations, call (632) 5231874. Visit also https://www.facebook.com/izakayakenta for more information and updates.